Ireland is a small island located off the west coast of England, in the North Atlantic. The third-largest island in Europe, it is separated from Great Britain to its east by the North Channel, the Irish Sea and St George's Channel. Ireland is a member of the EU, but not part of the Schengen Area. EU nationals can enter Ireland without a visa. There are also many countries that Ireland has a visa waiver agreement with. Please check with your local Embassy of Ireland as regulations are different for each country. Passengers older than 17 years old and arriving from non-EU locations are allowed to bring without customs duty 200 individual cigarettes, 100 cigarillos (max. 3 grams each), 50 cigars, 250 grams of smoking tobacco or proportional assortment 1 liter of spirits over 22%, or non-denatured ethyl alcohol with more than 80% volume, 2 liters of spirits or aperitifs made of wine or similar beverages less than 22% volume, or sparkling wines or liquor wines, a proportional mix of these products; and in addition, 4 liters of wine or 16 liters of beer, medicines in proportion to the traveler's needs (for all passengers), and other goods (for air travelers), up to a total value of EUR 430 per adult or EUR 150 for travelers aged below 15 years. Passengers who purchased items within EU countries are allowed the free import of, 800 individual cigarettes, 400 cigarillos (max. 3 grams each), 200 cigars or 1 kilogram of smoking tobacco, 10 liters of spirits over 22%, 20 liters of alcoholic beverages less than 22%, 90 liters of wine (though no more than 60 liters of sparkling wine) or 110 liters of beer. I had always heard people call Ireland the Emerald Isle, but until I bought a ticket to visit Ireland, I had no idea how lush, green and beautiful Ireland truly was. I set Ireland as one of my top ticket destinations for visiting on my European tour after college. I had saved up the ticket price for years in college, so it was really exciting to finally go on my trip to Ireland and the rest of Europe. I flew over on a cheap Ryanair ticket from New York. Ryanair was one of the first airlines to offer cheap tickets across the Atlantic, so they have gotten excellent at providing barebones but quality service for a low ticket price. I arrived in Ireland after sleeping on the plane, so I had a lot of energy and was excited to start my tour of Ireland. I bought a number of guided tour tickets for all over Ireland, including cultural and historical sites, some dating back to the early prehistory of Ireland. I had always been very proud of my Irish heritage living in Boston, so I was very excited when my family bought me a ticket to go and visit them in Ireland. I love all Irish culture, so the thought of being able to experience real Irish culture with a ticket to Ireland was amazing. They bought me a Delta Airlines ticket that flew directly from Boston to Ireland. The flight was long, but the crew did their best to make sure that I was comfortable. It was my first time flying, so I was really appreciative of how safe and comfortable the staff made me feel. When I landed I bought a bus ticket from the airport to the small town in Ireland where my family lived. They were all so happy to meet me, and we spent a lot of time driving around Ireland exploring all the sites. My husband bought us two first class tickets to Ireland to celebrate our honeymoon. Both of our families are originally from Ireland, so visiting Ireland was really important for both of us. My husband bought first class tickets from London on British Airways. It is a short flight from London to Ireland, so we enjoyed a nice lunch and a short film to pass the time. The service we received through out first class tickets to Ireland was excellent. Once we arrived in Ireland, we went around to a lot of the places where we had family and spent most of our time visiting them and getting to know everyone. Our honeymoon in Ireland was the ticket to a happy marriage that is still going strong today! Q. What are the best months to buy a ticket to Ireland? A. The busy months for tourism in Ireland are from May to September, so this is when airline and tour tickets are the most expensive. However, this is also when there are the most activities and the best weather in Ireland, so you definitely get more value for the price of your airline ticket and the tour tickets. Q. What is the weather like in Ireland? A. The weather in Ireland is very mild, but it can change quickly. This means that you will rarely experience extreme weather in Ireland, but you will experience a lot of variety in a short period of time. It can be rainy and warm one minute, and then chilly and windy the next. Airports handling direct flights to Dublin Airport •Frankfurt Airport •Amsterdam Airport Schiphol •London International Airport •Adolfo Suárez Madrid–Barajas Airport etc. 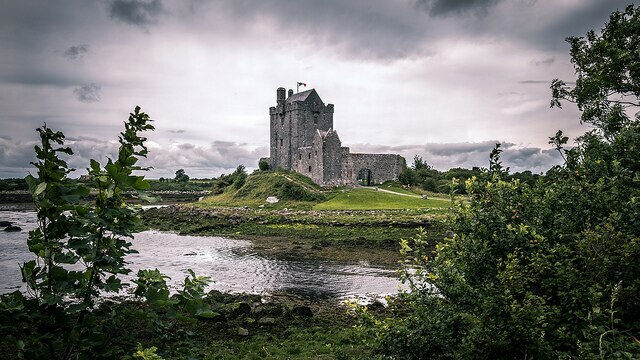 Since many major airlines have a base in Ireland for tax purposes, there is a wide variety of airlines to choose from when traveling to Ireland. The 4 main international airports in Ireland include the Dublin International Airport, Shannon International Airport, Cork International Airport and Knock International Airport. Ireland is a layover country for many international flights.